3. Make sure to have the Modifier license. 4. Launch GP and open Sales Transaction Entry. 5. 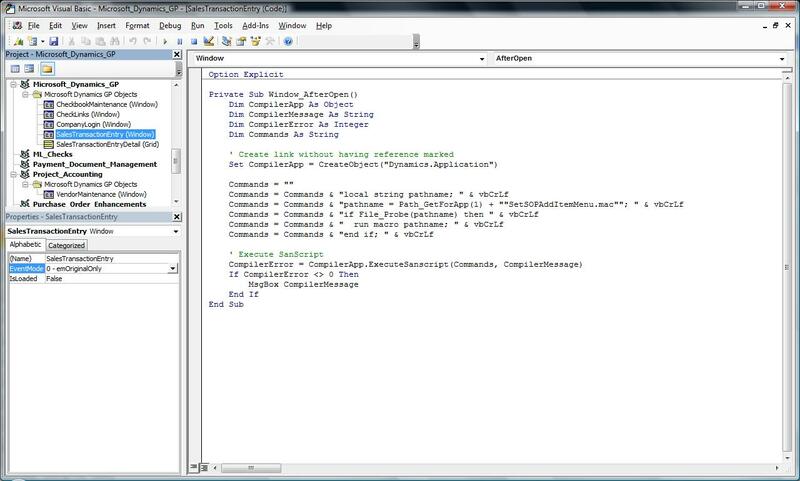 Add Sales Transaction Entry to Visual Basic Editor. Never mind if you see a message, that the window is already been added. 8. Make sure that, you replace the macro file name (which is shown above as SetSOPAddItemMenu.mac) with the name that you had given. 9. Save this code and compile for any errors. 10. This will do the trick of selecting “Add Item” by default whenever you open the Sales Transaction Entry form. There are so many ways to achieve this. I was quite excited with this method, as this is a plain VBA stuff and no Dex involved. The effort required to achieve this is not more than 10mins. And finally, it will work with much assurance. You can find the package to import and use this little customization from the link: SetSOPAddItemMenu.zip. I have attached an “Installation Readme” for a quick usage reference. Your comments / feedbacks are most welcome.